Member: Georgia Writers Registry. Please contact me for information and scheduling for readings. 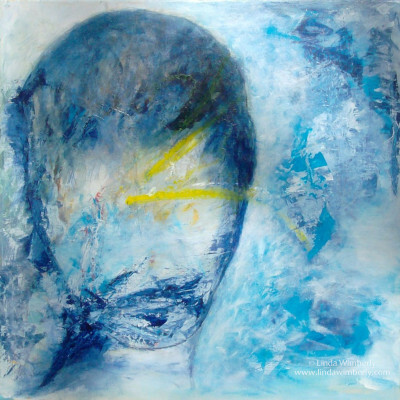 Creative Journeys, my blog about painting and writing. Find it here or subscribe below. Subscribe to receive emails when I've painted or written something new. It's official! 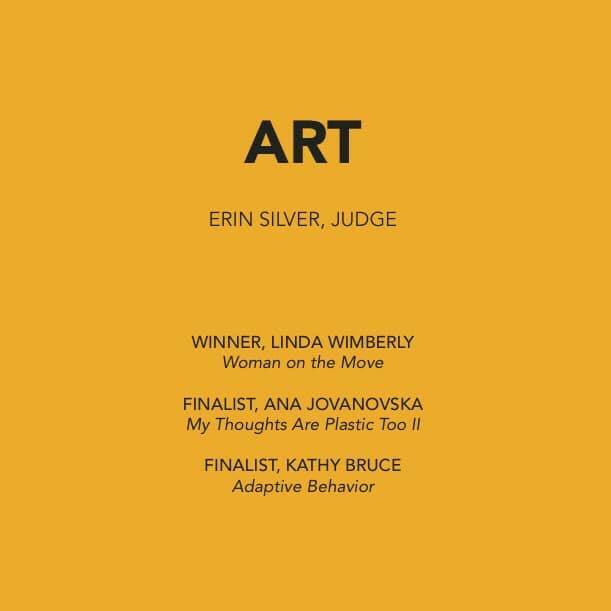 My painting, "Woman on the Move," won the 2019 Art Contest for So to Speak: feminist journal of art and literature (George Mason University). Thank you, So to Speak Journal! The journal will be available for purchase at the AWP Conference in March and online in April. I was immediately drawn to this dark, fragmented form juxtaposed against a bright (if slightly weather-beaten) yellow void. Within a black, vaguely feminine shape, tiny shell-shocked landscapes begin to come into focus. 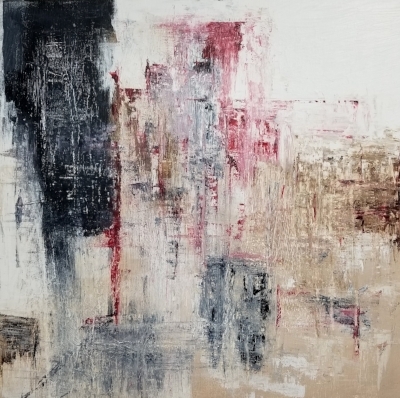 Divided and compartmentalized, almost reminiscent of county lines within a state, are shades of gray that keep you on the edge of seeing some kind of familiar scene or just a small mass of arbitrary lines and smears. It begs you to recognize and assign meaning to your ephemeral first impressions while threatening to devolve into chaos if you overstay your welcome. I feel that this push and pull is critical in engaging the viewer to do more than just scan the visual information and mindlessly move on. “The Question” was published in The Raw Art Review: A Journal of Storm and Urge, Winter 2019. It can be found on page 85. 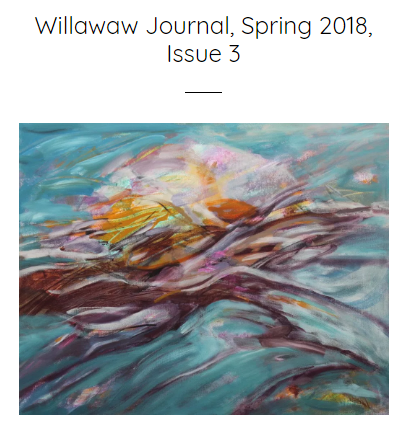 “Dawning of Identity” was published in the Willawaw Journal of Poetry and Art, Winter 2018 Issue 5. 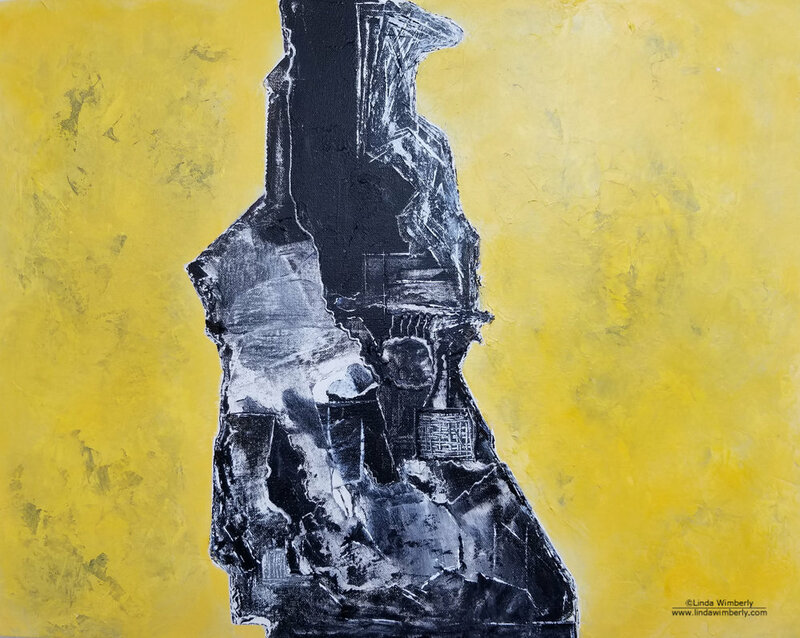 "Dystopia" is on display at Metro Montage XVIII July 8 - September 9, 2018 at the Marietta/Cobb Museum of Art. "When" and "What She Says" were included in Willawaw Journal of Poetry and Art, Spring 2018 Issue 3. "Failure to Communicate", "Cable News" and "Woman on the Move" have sold! Inscape Magazine, Cover art, detail from "Jazz Flavors," Vol. 42, 2017. March 2017 - Paintings in their new home in Atlanta with Mr. Bixby. "Inside the Dream" (image of mixed media painting) was published in Critical Pass Review, Winter 2017. "Jazz Flavors" (image of acrylic painting) accepted for publication in Inscape Magazine, Vol. 42, 2017. "Logic" was included in Lunch Ticket Literary Magazine, Antioch University Los Angeles, Winter/Spring 2017. "The Secret", a short story for ages 9-14, tackles the subject of mothers and children who find themselves abandoned and homeless – a subject far too many children either experience or for which they have real fears. The beginning sets the mood of fear but quickly moves to one of courage, the hope of sunrise and the beauty of the natural world. The voice is that of twelve year old Lacey who sees both the strength of her mother and the need for her own strength for both her mother and her little brother. Although a temporary solution, the end brings them to a better place through the kindness of a caring older man. "Your Voice Surprised Me" was included in Stone River Sky: An Anthology of Georgia Poems. This anthology was edited by Carey Scott Wilkerson and Melissa Dickson and published by Negative Capability Press in 2015. Stepping through dream windows, we look at the world as a child could see it. Dreams and Imagination combines reality with creativity and by using both a script and songs, it wanders through a land of discovery – of the world around children and of themselves and their place in this world. Children can imagine and become birds flying in the sky or bumblebees sipping on a flower, but through it all, they know they are loved and are very special. Dreams and Imagination is a journey into a child’s world, but it is also a positive statement of self-worth and love. As of March 2015, Children's Healthcare of Atlanta is using Dreams and Imagination for their patients. Both the activity book and the CD will be given to long-term patients, and the individual sheets of the activity book will be reproduced and placed in the Urgent Care and ER centers for the children to use while waiting to see the doctors. We are pleased to be sharing Dreams and Imagination with Children's Healthcare of Atlanta! Spring 2013: The Dreams and Imagination CD is now available in the Cobb County Library System. Check it out!